Editor’s Note: This is the first in a series of articles about Valvoline and Cummins’ attempt to compete at the 49th SCORE Baja 1000 in November 2016. Cummins engineer Roger England didn’t have much time to admire the view driving up the winding, 12.42-mile course at the Pikes Peak International Hill Climb near Colorado Springs, Colorado (U.S.A.). As if the treacherous mountain road, with its 156 turns, wasn’t challenge enough for the truck he was driving assembled by employees from Valvoline and Cummins, the temperature started rising in the high-performance engine they were testing. The crew thought they could keep the windshield on for the run, but now it seemed to block too much of the thin mountain air from reaching the radiator in the bed of the truck. That wasn’t all, the power steering pump started objecting loudly to the turns and steep climb. But there was one benefit to those challenges. England reached the 14,115 foot summit in just under 17 minutes, completing the first exhibition run up the mountain on June 25, the biggest day of the world’s second oldest motor sports race. His time, in fact, was about three minutes faster than the team expected. Roger England makes his way up the mountain during a test run at the Pikes Peak International Hill Climb. “We were very excited about the performance of the truck,” added Michael Wedding, Lead Build Engineer for Valvoline, who shares England’s passion for racing. The first-gen Dodge RAM pickup truck was developed to celebrate Valvoline’s 150th anniversary and the extensive research and development history between Valvoline and Cummins. It is one of two trucks Valvoline expects to enter in the 49th SCORE Baja 1000, the legendary off-road endurance race scheduled for Nov. 16 to Nov. 20, starting and ending in Ensenada, Baja California, Mexico. “Several Valvoline employees wanted to demonstrate our hands-on expertise by showing that we not only work at Valvoline, but also embody the spirit of the brand and understand how to get under the hood and create a competition vehicle,” said Jamal Muashsher, Valvoline’s Vice President of Marketing." The trucks are using custom built 5.9L common-rail remanufactured Cummins engines, similar to the 2003 vintage offered as an option in the RAM pickup truck. RAM introduced the Cummins mechanical 5.9L Turbo Diesel in the 1989 model year and that engine evolved into the 6.7L Turbo Diesel available today. The team hadn’t expected to do any serious testing until much closer to Baja but then received a last-minute invitation to Pikes Peak. Despite little time to prepare, they happily accepted. England believes the project harkens back to the days when founder Clessie Cummins tested diesel engine limits by racing them at the Indianapolis 500. Hours upon arriving at Pikes Peak, Roger England makes a practice run up the hill to learn the course. Pikes Peak re-enforced for the Valvoline-Cummins team just how important it will be to get both coolant and air efficiently to the radiator in the bed of the truck. Baja vehicles typically have the radiator there and go without a windshield. The team also will work on the pump that delivers fluid both to the steering and the brakes. It, too, reached higher-than-expected temperatures. After going over 70 mph at the bottom, England could only reach about 40 mph at the top, primarily because the engine temperature caused a decrease in fueling. Running a winding road course with a truck using 37-inch diameter tires designed for Baja also was a factor. Still, unlike many who raced up Pikes Peak that day, no hardware was damaged and the overall time was pretty good despite the lack of practice. The race winner reached the top in just under 9 minutes in a Norma M20 RD Limited race car. Blair Claflin is the Director of Sustainability Communications for Cummins Inc. Blair joined the Company in 2008 as the Diversity Communications Director. Blair comes from a newspaper background. 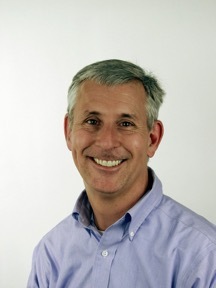 He worked previously for the Indianapolis Star (2002-2008) and for the Des Moines Register (1997-2002) prior to that.